The design stage of a product’s life cycle is arguably one of the most crucial decision making periods, as 70 to 80 percent of the overall manufacturing cost can be projected at this stage. Engineers must determine the preferred method of assembly early on and design the product to lend itself to this method in order to maximize productivity and efficiency. Massive savings can be obtained by predicting assembly bottlenecks and designing around them. Assembly method selection largely depends on the overall cost of the assembly, the number of individual components being assembled in a product, the number of versions of a product, and the production volume. For example, in the past, users traditionally opted for manual assembly, or hand assembly, when creating low-volume prototypes and automated assembly for mass producing the finished product. But this has now changed. 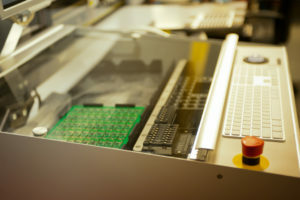 Advancements in automated PCB assembly and surface-mount technology (SMT) now permit automated low-volume production with the benefits of precision, production speed, lower component cost, and higher component density. As a result, engineers can elect to hire the services of PCB assemblers even for one to two boards. Once the assembly method has been selected, the product should be designed to suit that particular method. The end goals of designing for automated assembly are: reduce cost of assembly, improve quality and reliability, and reduce component inventory. Minimizing the number of components in the design is accomplished by eliminating excess parts wherever possible and combining two or more parts together with similar functions. It can be helpful to use the criteria established by G. Boothroyd and P. Dewhurst, creators of the Design for Assembly (DFA) method, to determine which excess component should be removed. For example, ask yourself: Does the part move relative to other parts? Must the part be isolated from other parts already assembled? Must the part be separate from all other parts already assembled to allow further assembly or disassembly? If the answer is no, then the part can probably be removed. Seek to design parts that snap together. Whenever possible, strive to reduce the number of screws used to fasten parts together by replacing them with self-aligning and self-locating features such as chamfers, guide pins, and dimples. This can help expedite the assembly and makes it easier for surface-mount machines to slide them together. If screws cannot be excluded, then make sure the screw heads are uniform throughout the design. Avoid using flexible, fragile, or abrasive parts as these run the risk causing defects. Ensure that each part has enough strength and rigidity to withstand the forces exerted during feeding and assembly. Select parts that can be easily orientated can save time and money as they usually do not have to pass through reorienting stations prior to being introduced to the assembler. Failing to do so might cause the machine to reject any part not placed in the desired position. Design using a top-down approach so that parts can be placed in a vertical manner, reducing the number of assembly movements and eliminating the need to re-orientate the central base or fixture during assembly. Lastly, remember that parts fabricated from injection molding, 3D printing, and sheet metal are easiest to modify without incurring substantial manufacturing costs. Contemporary 3D-modeling software allows design engineers to test the majority of scenarios before manufacturing the parts. Yet ultimately, efficient automation is not a replacement for a poor design. Want more information on PCB design? Read our Design Insights Guide.